Goophone has made a name for itself ripping off almost exact replicas of flagship smartphones offered by nearly ever other phone maker on the planet. 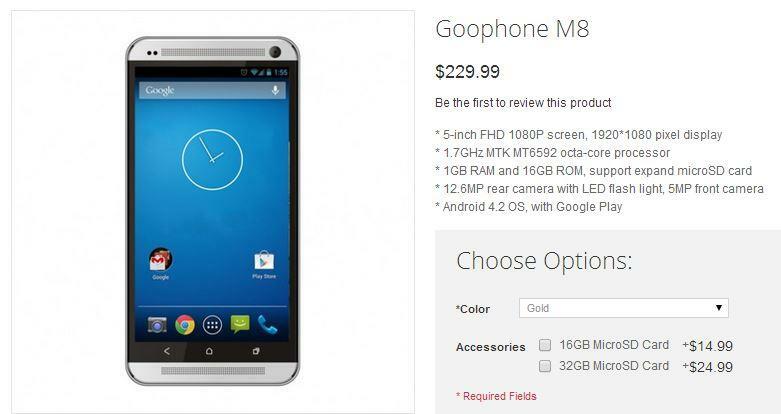 We recently saw a basic reproduction of the Galaxy S5, and now the company is listing a new Goophone M8 which is a clear ripoff of the HTC M8, otherwise known as the All New One. Of course there are huge differences. This device won't offer the same hardware at all – it just looks similar. You can see there's only one camera on the back of the phone, as opposed to the two lens setup we're expecting on the All New One. It doesn't offer flagship features, but it's also not that awful for $229.99 unlocked. You'll find a 5-inch 1080p screen,n a 1.7GHz MTK octa-core processor, only 1GB of RAM, 16GB of exapndable storage, a 12.6-megapixel camera, a 5-megapixel front-facing camera and more. It only runs Android 4.2, however, while we're expecting KitKat and a ton of other software features on HTC's new flagship. Also, you'll be stuck on 3G HSPA+ networks instead of LTE. It's kind of sad that Goophone can get away with copying the designs created by master engineers at competing companies, but at least there's an option for folks who can't afford the real deal.